The Red Top Fly Trap was something I discovered a couple of years ago and now buy half a dozen of these every year to control the number of flies around the garden and my poultry pens and houses that are spread across an acre of land. Living in the countryside next to fields where livestock are kept and having slowly increased the number of chickens I keep over the years, I have noticed quite a lot of flies around which I believe have been helped by the constant supply of manure around the place. A couple of years ago, I decided to try to control the numbers but didn’t fancy spraying anything nasty around the place. It’s against my principles of having an organic garden and I rarely use strong chemicals even for cleaning the birds coops out, opting for the environmentally friendly poultry shield instead. 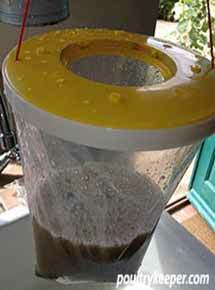 I came across the Red Top Fly Trap online and although at first I was concerned that this wouldn’t catch enough of the flies to make much of an impact outside, I have found them to work particularly well, especially if they are used at the beginning of the season when they can catch female flies that would otherwise be laying eggs. The red top fly trap bait is organic and non toxic so is safe for domestic animals like dogs, although hanging them up by their string means it is unlikely pets will get hold of them anyway. More seriously, these flies can be a vector for transmitting disease up to several miles away from the original farm source. The most common flies you will find around chickens are the common house fly (Mucas domestica) and the lesser house fly (Fannia canicularis). Their life cycle is similar, both lay around 80-160 eggs on chicken manure (a good reason to keep your coops clean if flies are a problem and especially if neighbours are nearby). These eggs hatch into larvae which change into pupa and then hatch into another fly. During warm summer temperatures, this life cycle can repeat in as little as 10 days. 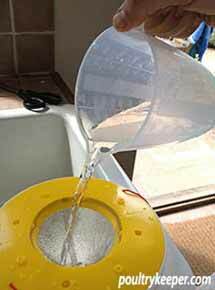 The Red Top Fly Trap works in a very simple way. Essentially, it is a plastic bag with a plastic top that has a ‘one way entrance’ or gap that allow flies to crawl in, attracted by the smell and not be able to find their way out again. 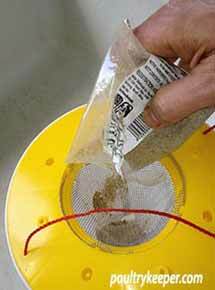 There is a small piece of mesh in a funnel shape that guides the fly downwards into the bag. Once a fly is inside the bag, it can fly around but is unable to find the small opening in the mesh that it came in through. In the bottom of the bag, there is a mixture of –well I’m not sure what it is, but it smells pretty horrible to me but certainly attracts the flies. I couldn’t smell the trap unless putting my nose to the top of it though. Eventually, the fly will crawl into or fall into the mixture. The trap is capable of catching 20’000 flies and by the end of the season, and as you can see to the right, there is quite a build up of flies in the bottom of the bag. At the end of the season, you simply take the bag down and put the trap in the rubbish bin. Each trap comes flat packed in a bag and it’s very easy to assemble the trap. First, open up the bag and place the attractant that is in the sachet into the bottom of the bag, adding the prescribed litre of warm water with it. Place the lid on the trap and find a tree or similar to hand the trap in. 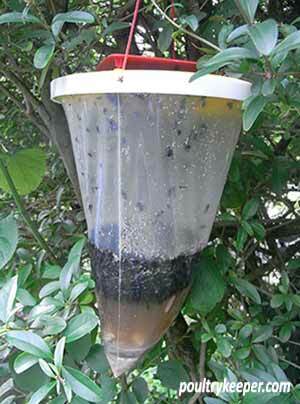 The traps attract flies so ensure you place them away from your home. They do smell once they get going so I have found it convenient to place them a few meters up into trees where you’re less likely to get a waft of one when walking by. ​Add the clip-on red top and that’s it, it’s ready to put outside! 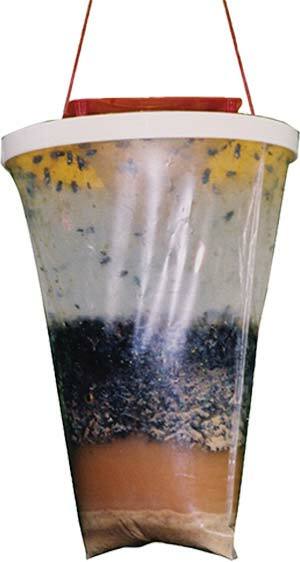 You’ll soon notice flies building up inside the trap and the numbers of flies dropping. I use 6 traps spread over an acre of ground. Red Top Fly Traps can be bought in large multi-packs or as single units. I have found it more effective to have a couple in use in different locations for the biggest reduction in flies. Remember not to put them near your house or you will be attracting flies nearer your home! The Amazon Marketplace offers some of the best prices if buying online. Set traps early in the season (Spring) to catch females that will otherwise lay eggs. Place the traps in trees or in hedges away from where you’ll smell them. Do not place traps near your home or where you don’t want flies – They are attracted to the trap.